Archbishop Stanislav Zvolenský, archbishop of Bratislava, will preside at the ceremony of the closure of the diocesan process of the cause for beatification and sainthood of the Jesuit novice Tomáš Munk and his father František on April 20, 2015. The Family Munk were Jewish converts to Catholicism in 1939. Tomáš entered the novitiate in Ružomberok in 1943. 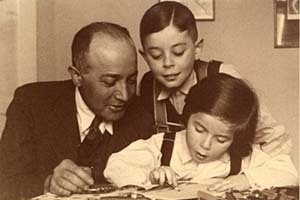 Due to the Nazi ideology against Jewish people, the Munk family were captured by Nazis at the end of 1944. Tomáš was captured in novitiate and later was deported together with his father to the concentration camp Sachsenhausen. Father and son were shot to death during the death march from Sachsenhausen to Berlin on April 20, 1945. Another good example of holiness in families. I wrote about Tomas in 2009 here at the Communio blog. The day after to the liturgical and civil observance of Saint Valentine (bishop and martyr) we have one of the great proponents of Divine Love, the Jesuit Spiritual director of Saint Margaret Mary of Alocoque, Saint Claude la Colombiere (1641-1682). The example of Saint Valentine needs to be followed; one of his 17th century disciples was a Jesuit who knew first hand the meaning of what it means to follow God’s approach: love. 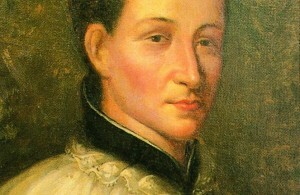 The decisive event which marked the life and spirituality of Saint Claude La Colombiere was certainly his meeting with Sister Margaret Mary Alacoque, which took place in the Visitation Monastery in Paray-le-Monial in February 1675. On the occasion of a meditation which he gave the community, an interior voice suggested to the woman religious to turn to him in confidence: “This is the one I am sending you.” In face, from her first confession, Fr. Claude was aware of the authenticity of the mystical experience of the young Visitation Sister and Margaret Mary knew she was seeing the fulfillment of the vision of the flaming heart of Jesus with two other hearts which became lost in the divine heart: hers and that of the spiritual director who had been sent to her. May we learn from Saint Claude la Colombiere what it means to be in relationship with Jesus the Good Shepherd, true Divine Love. Today, particularly on the Jesuit ordo, is the Feast of Saints Edmund Campion, Robert Southwell, and the English Jesuit martyrs. These men of God were tortured and executed for their faith in Jesus Christ and their adherence to the authority of the Roman Pontiff in Elizabethan England. One of the famous texts from this era is “Campion’s Brag,” Saint Edmund’s clear and undisputed defense of the Catholic faith. Through the intercession let us pray for the Catholic Church in the UK, and in the USA. vi. I would be loath to speak anything that might sound of any insolent brag or challenge, especially being now as a dead man to this world and willing to put my head under every man’s foot, and to kiss the ground they tread upon. Yet I have such courage in avouching the majesty of Jesus my King, and such affiance in his gracious favour, and such assurance in my quarrel, and my evidence so impregnable, and because I know perfectly that no one Protestant, nor all the Protestants living, nor any sect of our adversaries (howsoever they face men down in pulpits, and overrule us in their kingdom of grammarians and unlearned ears) can maintain their doctrine in disputation. I am to sue most humbly and instantly for combat with all and every of them, and the most principal that may be found: protesting that in this trial the better furnished they come, the better welcome they shall be. viii. Moreover I doubt not but you, her Highness’ Council, being of such wisdom and discreet in cases most important, when you shall have heard these questions of religion opened faithfully, which many times by our adversaries are huddled up and confounded, will see upon what substantial grounds our Catholic Faith is builded, how feeble that side is which by sway of the time prevaileth against us, and so at last for your own souls, and for many thousand souls that depend upon your government, will discountenance error when it is bewrayed [revealed], and hearken to those who would spend the best blood in their bodies for your salvation. Many innocent hands are lifted up to heaven for you daily by those English students, whose posterity shall never die, which beyond seas, gathering virtue and sufficient knowledge for the purpose, are determined never to give you over, but either to win you heaven, or to die upon your pikes. And touching our Society, be it known to you that we have made a league—all the Jesuits in the world, whose succession and multitude must overreach all the practice of England—cheerfully to carry the cross you shall lay upon us, and never to despair your recovery, while we have a man left to enjoy your Tyburn, or to be racked with your torments, or consumed with your prisons. The expense is reckoned, the enterprise is begun; it is of God; it cannot be withstood. So the faith was planted: So it must be restored. 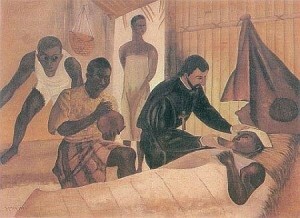 Today is the feast of St. Peter Claver. 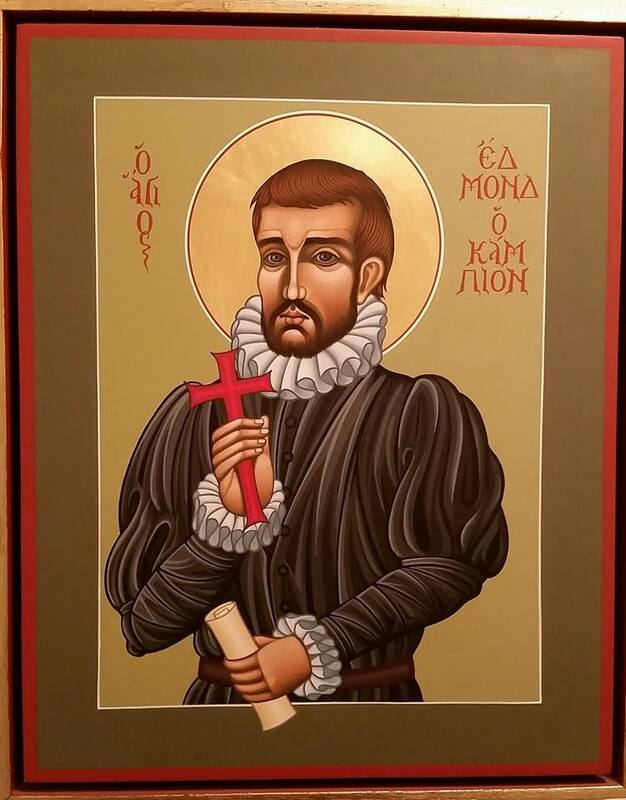 The Church liturgically recalls for us one of the Master’s of the spiritual life, Saint Ignatius of Loyola. The Pilgrim died in 1556 and was the author of the Spiritual Exercises and founder of the Society of Jesus. It may be a little early to speak of a commemoration for the 500th anniversary of the Spiritual Exercises, but it may be good to keep this anniversary in mind. 2022 is the year when we will study and live the foundational experiences of Ignatius in Manresa. 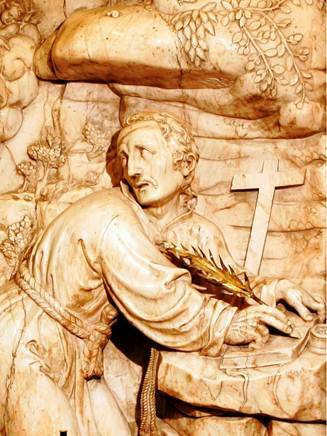 This picture shows Ignatius in awe in meeting the Lord as he writes his religious experience that gave rise to him following his vocation with prayerful intensity. Do we have a similar conviction as Ignatius? This 2008 animation of an Olive, gives a sense of the life Saint Ignatius of Loyola, written, produced and narrated by Jason Kapell of the Fairfield University Media Center. It is nicely done –remember it is short and sweet with a Spanish Olive narrating.